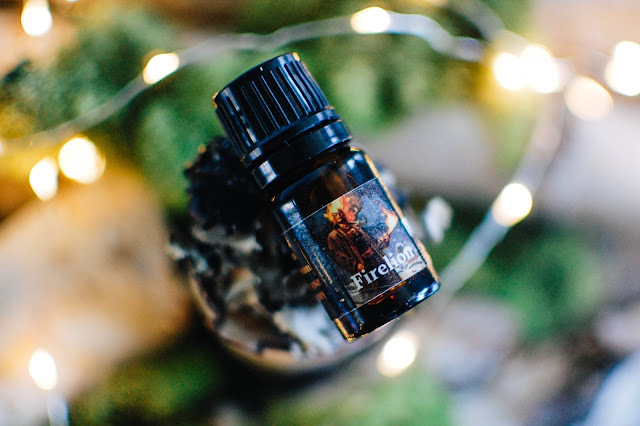 Firelion swells out of the amber bottle on a green wave of herbs, charred wood and amber. It smells salty and warm yet green somehow. Once dabbed onto the wrists, the creamy pepper of cardamom lies beside the intimate musk of saffron and they embrace to create a warmth on the skin. The drydown lulls the senses into calmness with a sultry skin musk and amber that hums with a drop of vanilla sweetness. A swarthy undercurrent of oudh sneaks in on its belly and shadows the scent like a vignette, just darkening it around the edges. The guaicwood and amber in this scent appeal to my senses greatly and pull through on my skin the most. I love this scent. It is smooth and warm. It holds closer to the body but I can smell it as I go about my day, here and there, a glance of scent. I enjoy the amber in this scent enough that I picked up a bottle of Ozymandias. This perfume oil is part of the collaboration collection based on Dan Brereton's Nocturnals comic book series and still available.